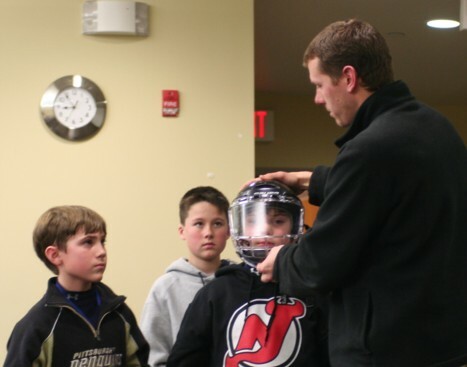 Safe Kids Atlantic/Cape May together with Atlanticare Health Services hosted a sports injury prevention clinic, Get Ahead in the Game – Prevent Concussions, for coaches, athletic trainers, parents and children recently to focus on injury risks associated with ice hockey and lacrosse. 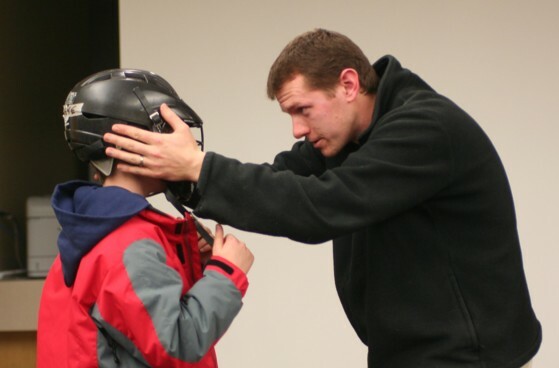 Former Philadelphia Flyer Keith Primeau discussed a player’s perspective of safety and importance of using correctly fitted, appropriate helmets to prevent concussions in sports. Primeau retired in 2006 after suffering the most severe concussion in a series of head injuries, ending his 14 year NHL career. Coaches, athletic trainers, nurses and parents listen intently as Keith Primeau speaks about his experience with multiple concussions, which eventually ended his career with the Philadelphia Flyers. Given that more than 30 million children nationally participate in sports each year, and over 3.5 million receive medical treatment due to sports injuries, Safe Kids New Jersey believes that youth sports safety is a challenge worth facing. Watch for more to come from Safe Kids in the upcoming months on sports injury prevention.